Friday was interesting in that the long-awaited jobs numbers for March came in about as expected, and the market sold off pretty hard. 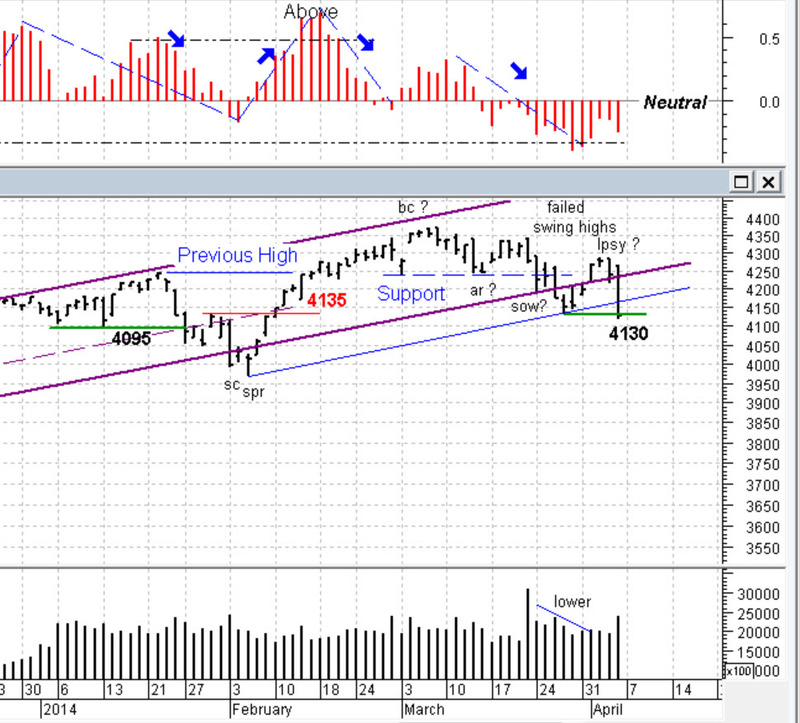 Note the chart below: Friday was a wide range bar on increased & heavy volume. The sellers were firmly in control and the buyers, well, they just sat back. I continued my Wyckoff labeling (for those interested) and called Wednesday (that narrow range rather low volume bar) as the LPSY for this structure. But also note the question mark as I sure would like to see a follow thru to the down side Monday to confirm the structure. True the close was below the 4130 level, but not by much. I always look at Support and Resistance level as more of an area and not exact, plus a violation with a closing price is far more committal than just an intraday breach. What do we see in this chart? (note: you can click on it to enlarge it) Since early March I see lower Highs and lower Lows, plus more supply (volume) coming in on down bars, and those down bars typically have a greater (price) spread. These are “Bearish” patterns. Also my blue price channel line has technically been broken. Don’t get me wrong, all Hell is NOT about ready to break loose. Look at the general economies of the world. While not exactly strong, they are also not exact weak either. This looks like it could be that correction that we’ve been waiting (and waiting) for. Nothing ominous, just a pause, a correct and a breather because this market has gotten ahead of itself. Next week is important though. How will institutions react to Friday? Do they take this as an opportunity to buy (as before) or do they pull back? We don’t know, but we also won’t have to wait very long to find out. Since this is early in the 2nd quarter that quarterly performance figure will not weigh very heavy in their outlook. It should be a pure play and indication of what the “Smart Money” (the CO) is thinking about the immediate future of this market. For those interested I’ve posted my monthly newsletter under that tab (above). My “SRCM Client Report” is less technical, but does cover areas that I don’t cover here. And, as always, you are welcome to leave comments by clicking that area at the top of this post. Until next week, be careful out there, but more import, be observant and “stay in the now” of this market. Don’t judge, don’t predict, observe the flow and act accordingly. Cheers! ………….. Tom …………….